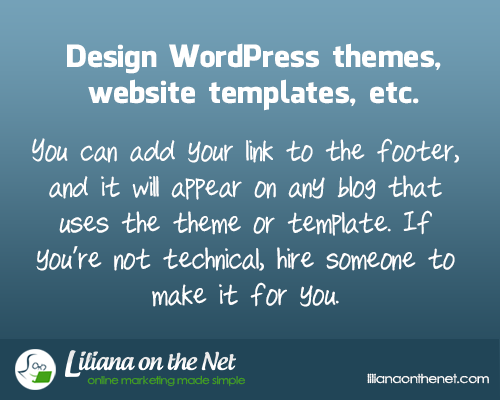 You can add your link to the footer and it will appear on any blog that uses the theme or template. If you’re not technical, hire someone to make it for you. Think how many times you have visited a blog and clicked on the theme link at the bottom. If it is there, I do it quite often, just for curiosity or because I really like the theme and keep a note for research purposes and for future blog posts. Well, how do I design a WordPress theme or website template? Also you want to think what other pages and post templates you want to provide. Color choices, fonts, especial features. Your theme must be responsive, that means that can be seen without losing shape on mobile devices. Buy a PLR theme and customize it yourself. Buy a PLR theme and have it customized by a freelancer. Buy a PLR theme and release it with your link. Advantages of giving away a WordPress theme or website templates. 1. Themes, like software, have a higher perceived value than eBooks. 2. Your link will be in each website that installs the theme. 3. You could give it away for exchange of email addresses thus building your list. 4. We all need squeeze pages for our offers, there are some plugins that let you do a squeeze page easily but for those that are not in the Internet Marketing niche but need occasional squeeze pages they will welcome a theme with the facility of building a squeeze page easily. Also the plugins are premium and carry a cost. 5. You can also add paid services to your theme such as installation, header graphics and plugins (again you can buy PLR plugins that let you customize them). I am becoming more aware of this. It sounds like from reading your blog you do have to buy though right? Yes you normally have to buy the PLR themes but they might be some free with the license for you to alter. Ah! I’m on WordPress, so I’ll find this very helpful!